OK, here’s a question for you, sincere and coming in the desperate final days of the seasonal baking frenzy. How the HELL do you decorate sugar cookies? This seems to be a skill women pick up when they become mothers, like menu planning and being able to hem pants. Except once again, I never got the memo. I know, I know, I’ve read the cookbooks and the blog posts. I’m supposed to make the icing, and then I either do little things with a toothpick or else put it in some kind of pastry bag and pipe it on. Neither one works for me, though. Never has. Didn’t this time, either. Baking and decorating sugar cookies is supposed to be a basic, easy, family-fun sorta thing. And this year, with visions of elaborately decorated holiday cookies dancing in my head, I thought I’d do a little research and do it right this time. How hard could it be, really? 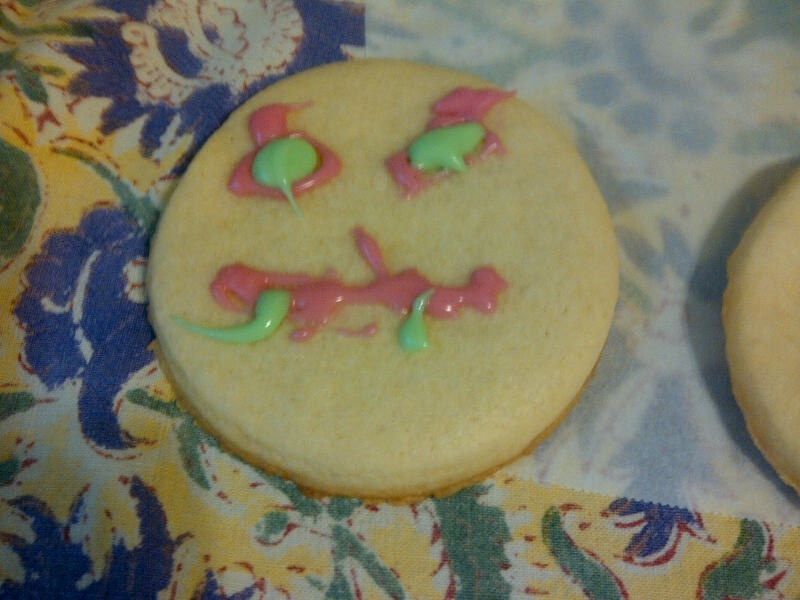 But I did manage to make what I think is a sugar cookie. The page had fallen out of my well-loved volume of How to Cook Everything, so I couldn’t read the intro to make sure. It was in the cookies section, and it did look like the basic sugar cookie. 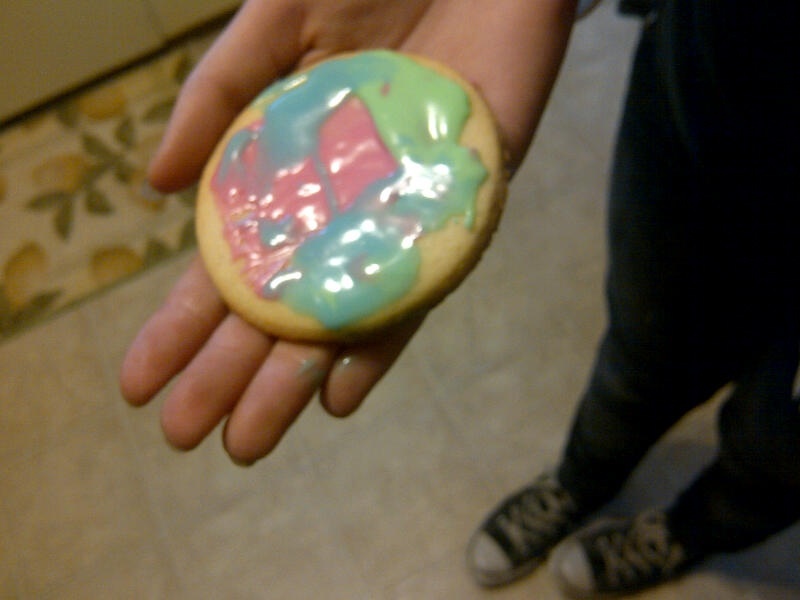 But the end result wasn’t quite as sweet as I thought sugar cookies should be. Which isn’t to say they weren’t delicious tea cookies. I made the dough, chilled it for a couple of hours, rolled them out. Use an electric hand mixer to cream the butter and sugar together until light (it’s just easier). Beat in the egg. 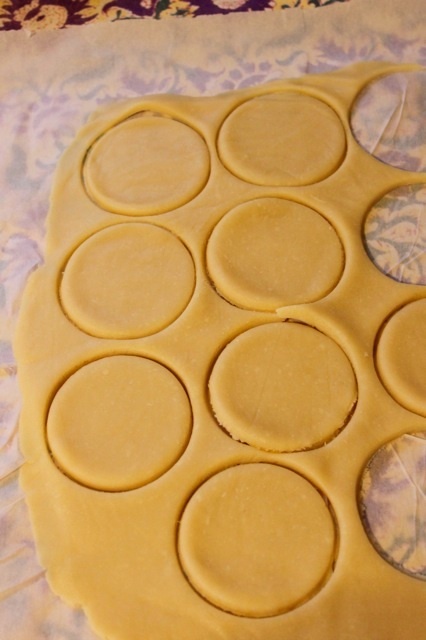 Shape the dough into a disk, wrap in wax paper and refrigerate for at least two hours (or as long as two days). Preheat the oven to 400 degrees. I find it easiest to let it warm just a bit, then roll it out between two sheets of wax paper. Cut into shapes. Or, if like me you suddenly can’t find your cookie cutouts, use a glass, rim dipped in flour, to at least make nice circle shapes. 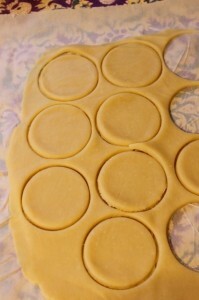 Bake on a lightly-greased baking sheet until the edges are lightly browned and the center set, about 6 to 10 minutes. Let rest on the cookie sheet for a few minutes before transferring onto a rack. Here’s where some strategic Googling came in. I know. I should have done this first. 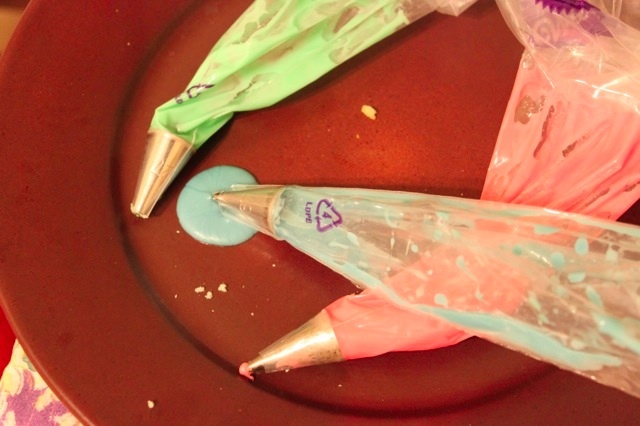 Come to find out there are many different ways to decorate sugar cookies: Frosting vs. icing. Decorating before baking vs. decorating after. 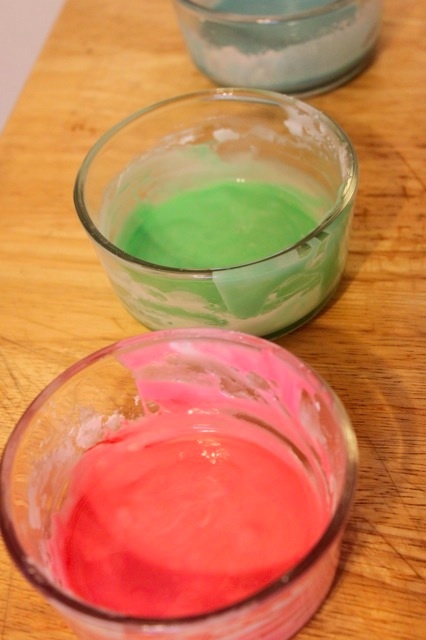 Different ways of making icing. Royal Icing is stiff and not that sweet but it’s great for use on gingerbread houses, for example. You need to buy something called meringue powder for this. In the end, I opted to make icing instead of frosting, even though I didn’t have the goods to make royal icing. I just like the word “icing” better. So I made icing in three little bowls using powdered sugar and a little milk. Then I added food coloring. Just the basics. It was easier to get the frosting into these little bags than it was to get the meringue into the pastry bag last week. Remember that debacle? But then I lost my focus. The kids stormed the kitchen and demanded to help decorate the cookies, even as they were shoving them into their hungry little mouths. What could I say? I handed them each a pastry bag and let them have at it. Guess which child did this one? 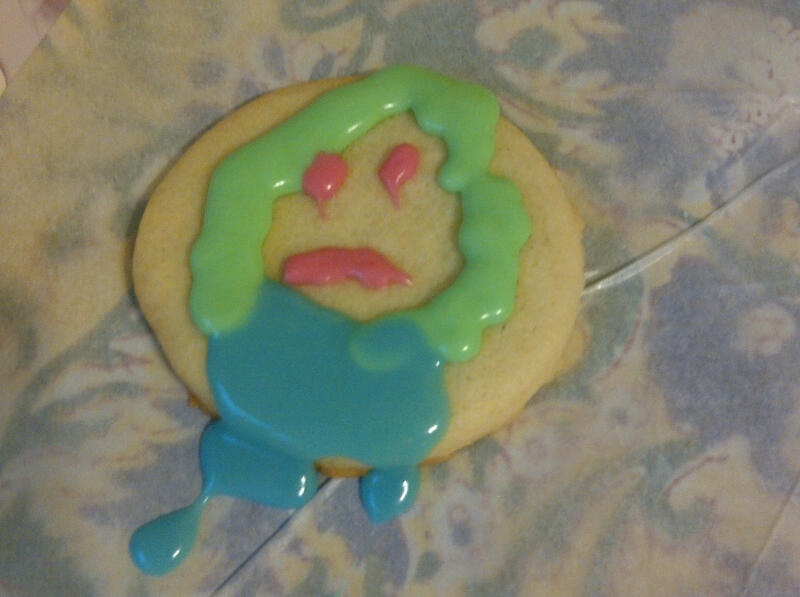 Still, even though the cookies were cool to the touch, the icing quickly lost its shape and blended into blahs. Maybe I should have tried the toothpicks? That I can’t make adorable little faces and scenes on cookies like many of my stay-at-home mom friends shouldn’t surprise me. I could never cut a neat shape out of construction paper in Kindergarten either. And it’s been all downhill since then. At the end of the day, however, the sugar cookies, badly decorated though they were, are all gone. That’s a plus, right? At least the cookies came out? The cookies have to be absolutely cool. Like, cooled for two hours on the rack, before you can attempt to decorate them. How you keep the kids away from them that long is another vexing problem I have not yet been able to crack. You should have a plan. An idea of how you want to decorate your cookies. If only so you can make enough icing, and in the right colors. Decide beforehand whether you want to make frosting or icing or royal icing, and follow a legitimate recipe for making this. Don’t wing it if you don’t really know what you’re doing (ahem). Good luck out there! And Happy Holidays! Wow, those are sadly beautiful. Like a clown getting hit by a car. Julie – I laughed out loud at so much of this. Thanks for making my day. Hope the holidays are great for you and your family. Kudos to you for trying, Julie! Decorating cookies requires too much effort from the small-motor skills department. I made a really easy chocolate chip pound cake and called it a day. Happy, merry! I really like the one that looks like tie dye. Yeah, I did that one on purpose….cough…. I’m not sure, but you may have stumbled upon a whole new category of cookie decorating! It’s brilliant -maybe post-modern? I just loved reading this. Thanks for the laughs and the smiles. As usual, I can totally relate! 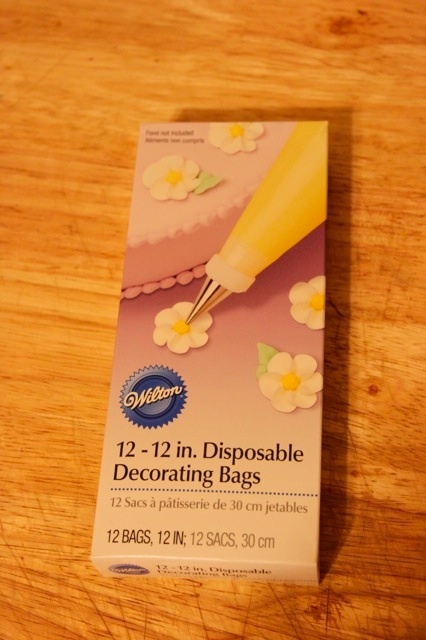 You dont need meringue powder for royal icing. You just need eggwhites, sugar, and patience. Butter cream frosting works quite well on sugar cookies – see the back of the powdered sugar box for a recipe. the glaze/icing you chose makes lovely stained glass window effects in the hands of my 4, 5, ,6 and now 7 year old, but looks sort of sorry when I do it. I think lack of inhibition is key. also saturated colors. I liked yours. I’d eat them, and that’s what matters, no? Kouign – You know it! And the cookies did turn out…so…half a victory! Awe…Lol. They’re unique, perfection is over-rated anyways. I would have bought these in a bakery over any others. They would be a cute conversation piece. And at least no one would challenge you that they’re homemade. lol. Maybe sugar cookies are a medium suited to Impressionism? Perhaps something that doesn’t melt could work using pointillism?